ABC Costing is a logical alternative to traditional cost management systems that tended to produce insufficient results when it came to allocating cost. 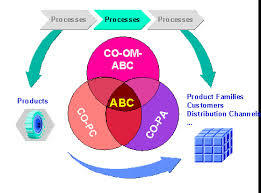 The concept of ABC came into prominence with the development of ABM by cooper and Kaplan in 1988. ABC concentrates on the need to make a more realistic allocation of overhead cost to products. It emphasizes the requirement to obtain a better understanding of the behavior of overhead cost, and thus ascertains what causes overhead cost and how they relate to products ABC provides information to identify the components of overhead more precisely, assigns cost of resource to products more accurately, and as a result it acts as a decision support tool for companies. The implementation of ABC is justified if the cost of installing and operating the system are more than offsets by the long term benefits. Several limitations of ABC are presented in. Element of ABC include Activity: Work performed within an organization or the aggregations of action performed within an organization. Activity driver: Associates activates with their respective cost object. Activity drivers’ measure the frequency and intensity of the demand placed on activities by cost objects. They are typically a one-to-one relationship with the activity. Activity measures: A measure of the workload involved in the activity. It can be similar to the activity driver. Bill of activity: A listing of the activities required (and optionally, the associated cost of the resources consumed) by a product or other cost object. It should list each activity, activity drivers, number of units, unit cost per driver, and extended cost that, taken together, compose the total for any particular cost object. Cost drivers: Any element that would cause a change in the cost of activity. Cost elements: An amount paid for a resource consumed by an activity and included in activity cost pool. Cost objects: Any customer, product, service, contract, project, or other work unit for that separate cost measurement is desired. Performance measures: Indicators of the work performed and the results achieved in an activity, process, or organizational unit. Performance measures may be financial or operational. Processes: A series of activities linked to perform a specific objective. Resources: An economic element that is applied or used in the performance of activities, salaries and materials are resources used in the performance of activities. They can also include any non-monetary assets that are essential for the completion of the item. Resource drivers: A measurement tool to associate cost with their respective activities or cost object resources drivers measure the quantity of resources consumed by an activity, typically a one-to-one relationship with the resource.